Hi Everyone! 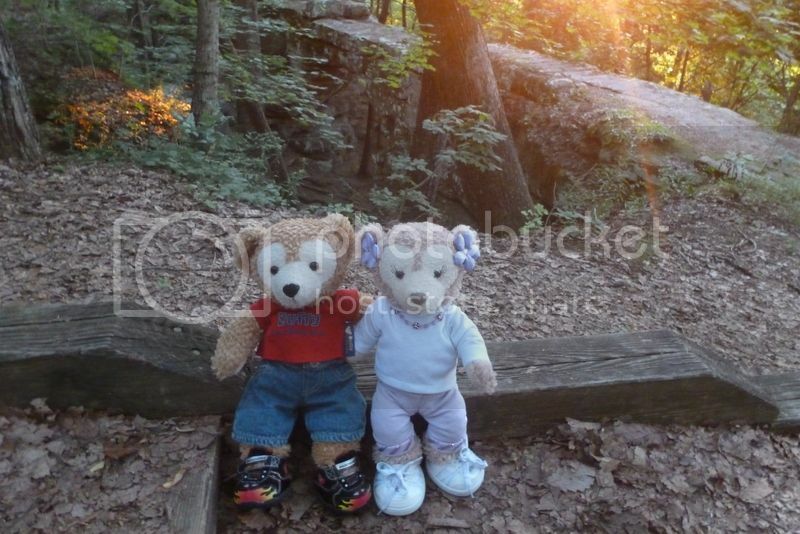 I'm new to the wonderful world of Duffy and Shellie May. 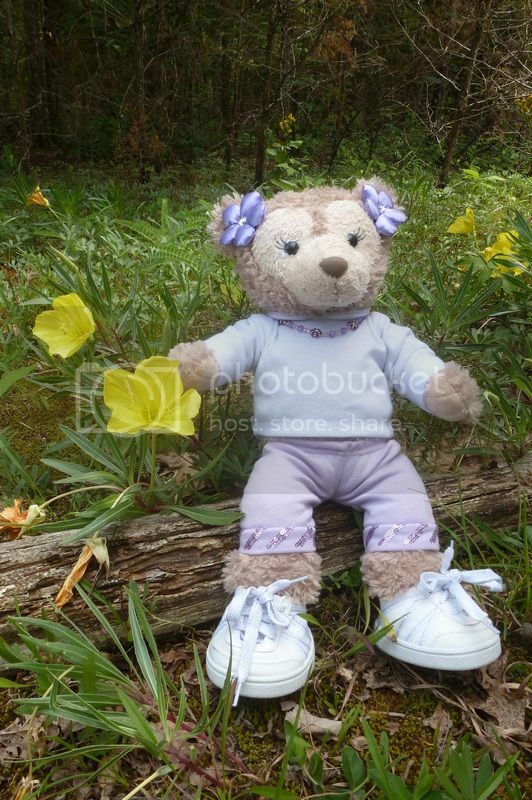 Using a neat Japanese website I've been sewing clothes for my Shellie May (who I named Kasumi). Here's a picture of her in a dress and cape I made. Sorry its sideways I'm new at this! that is gorgeous, as is Kasumi! Please be sure to post in our sewing thread too! We need to keep it open. You can add tips. Yes! I love Kasumi and her clothes! I'd love a link to the Japanese site you used! http://micechat.com/forums/duffy-dis...signs-2-a.html is the sewing thread. Thanks! I'll post the website and my picture in that thread. I'm happy Kasumi and I are welcome here! Browsing the Via Napoli kids' menu. We went to dinner there in December and I kept asking to take more. They were a bit stingy, but I came away with six of them. Those are really cute menus! I would add that to my collection of Duffy memorabilia...whenever I get to EPCOT. Today we all had a long day, but it's okay because I have Sunday and Monday to relax. 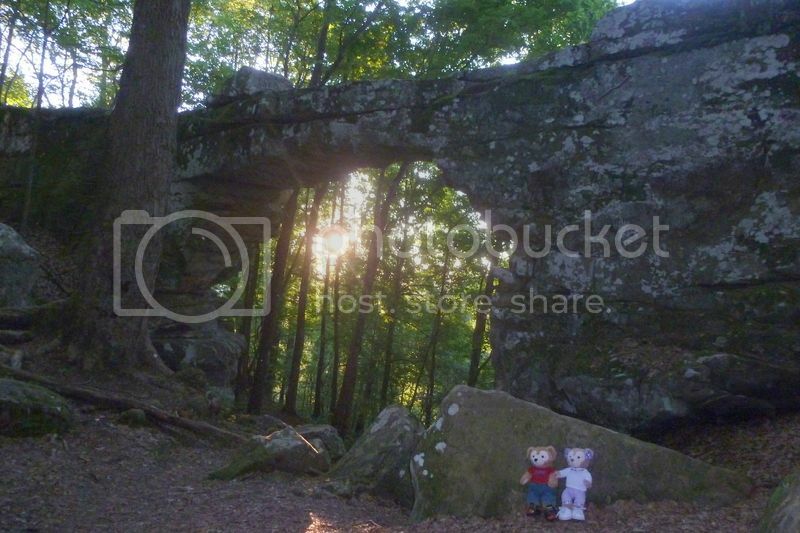 First we went to Sewanee, TN to see the natural bridge. 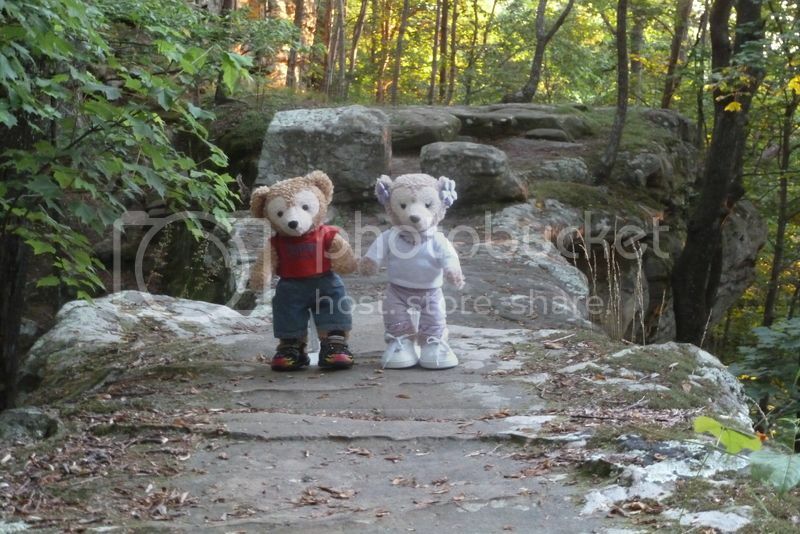 Duffy and Shellie May walked across the bridge, with me following. 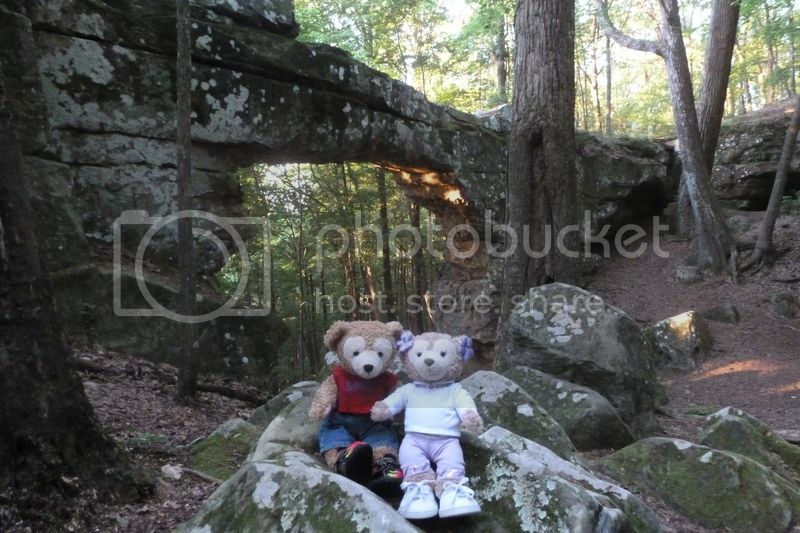 Duffy and Shellie May posed with the natural bridge behind them. 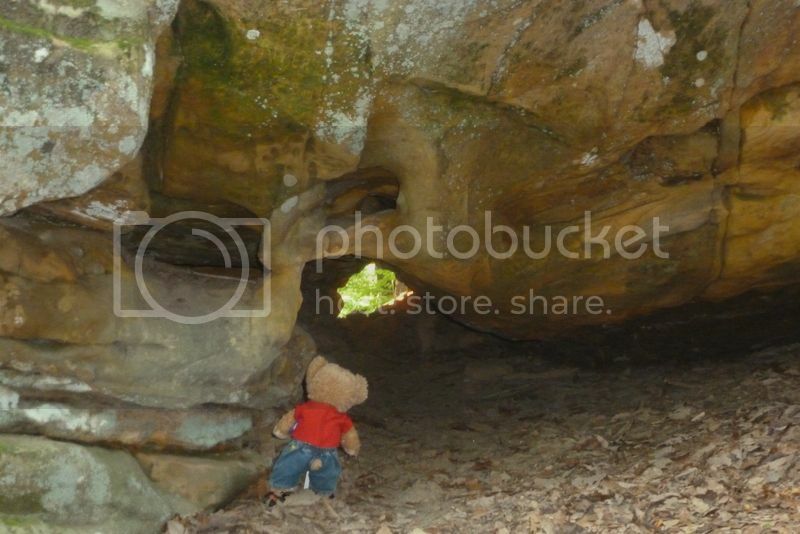 Duffy discovered a bear sized tunnel. Shellie May declined to get close. 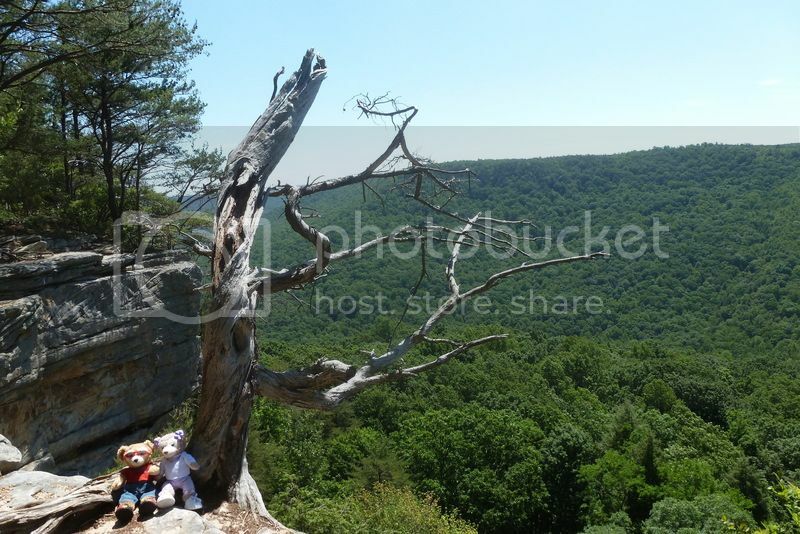 "Who cares if we have not seen a new state yet this year when there is still so much to explore in Tennessee?" Shellie May said. "Yup," Duffy agreed. Sometimes he is a bear of few words, although he is congenial enough. There were alot of stairs to climb on the way back to the parking lot. 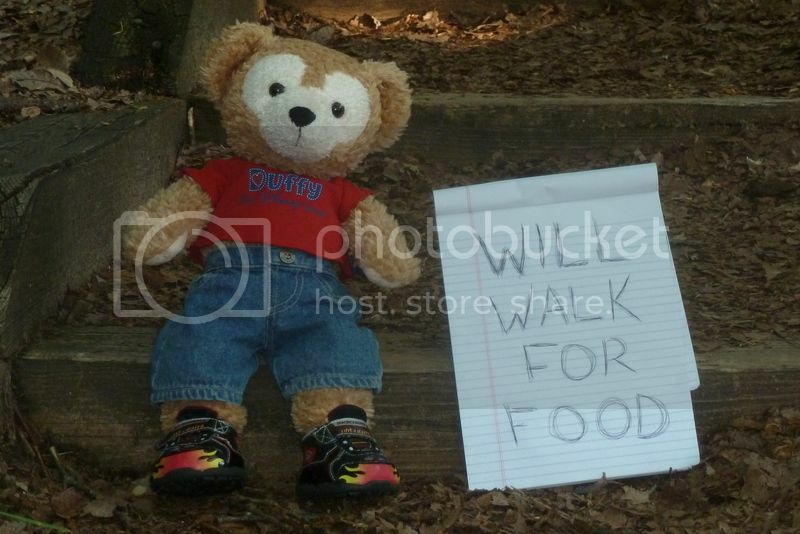 What is Duffy standing next to? Oh! I bet he saw the giant chocolate chip cookie in the car. I was going to give it to him and Shellie May anyway. "Even though you carried me, I still get a piece, right?" asked Shellie May longingly. "Yes, share and share alike," said Duffy. 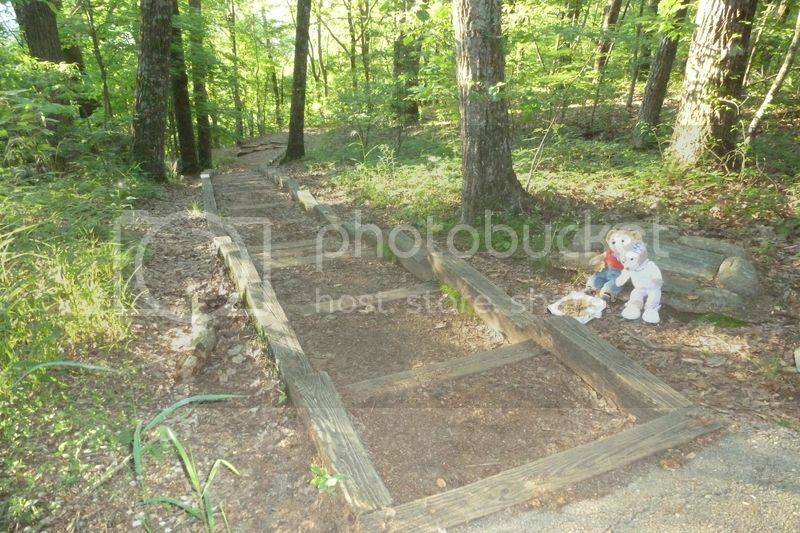 Next we went to South Cumberland State Park, which has several unconnected natural areas covering two counties. 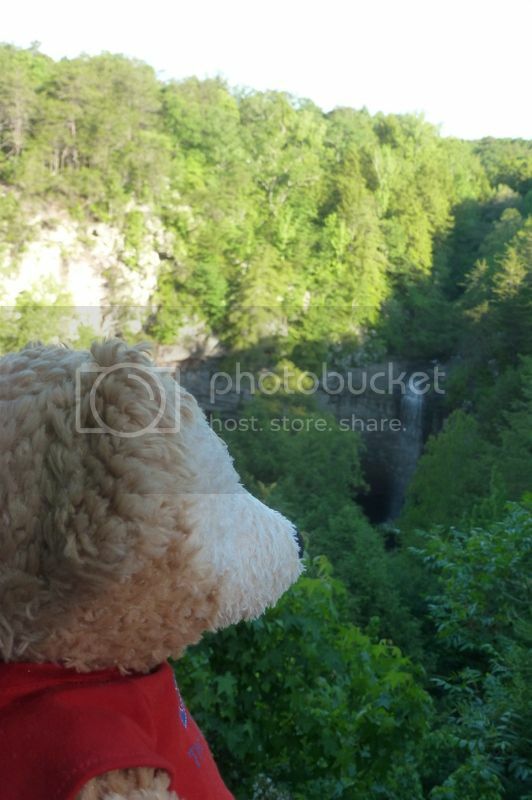 We saw Foster Falls. 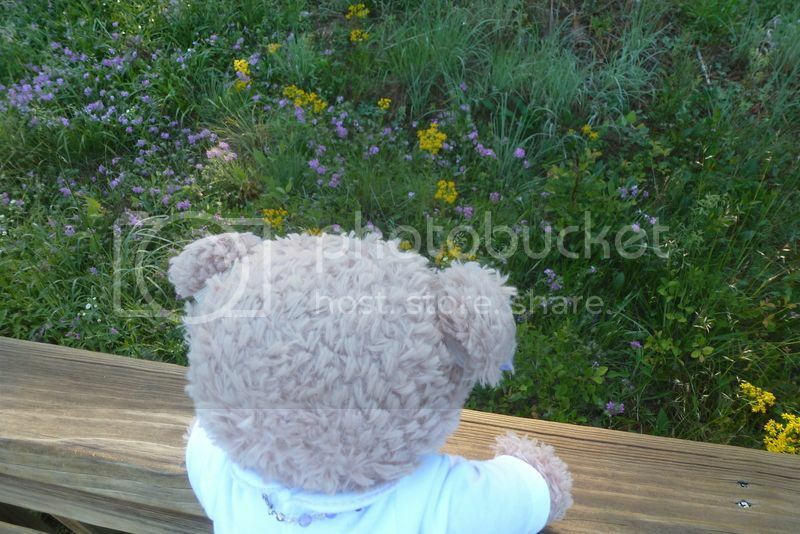 Shellie May admired the spring flowers. 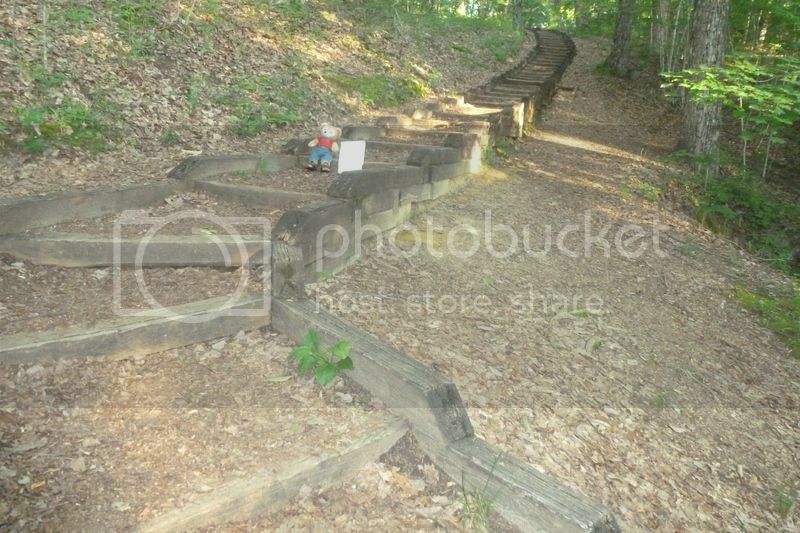 We went to another section and walked the Greeter Falls trail. 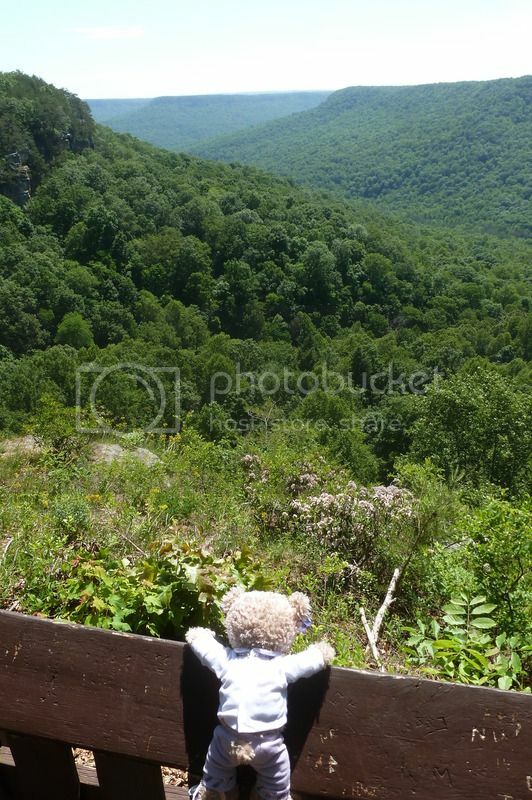 Shellie May stopped to smell the mountain laurel...which has NO scent! 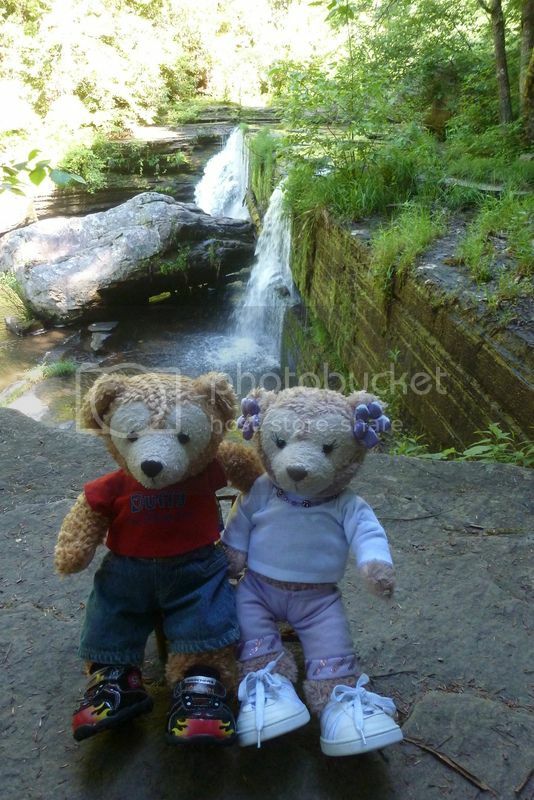 Here are da bears at Greeter Falls. It is such a pleasure to travel with them because they get along so well and there is never any bickering. Disney Bears are da best! 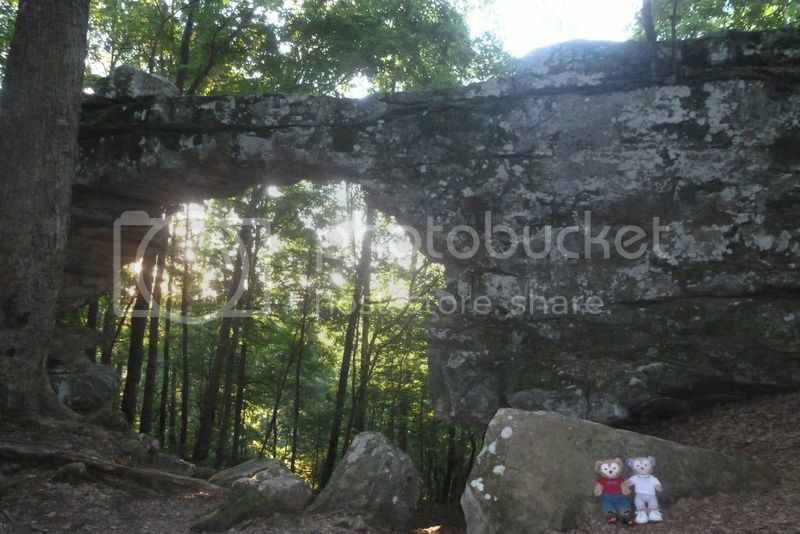 They were dismayed when we started the Stone Door trail and stopped at Laurel Gulf overlook. 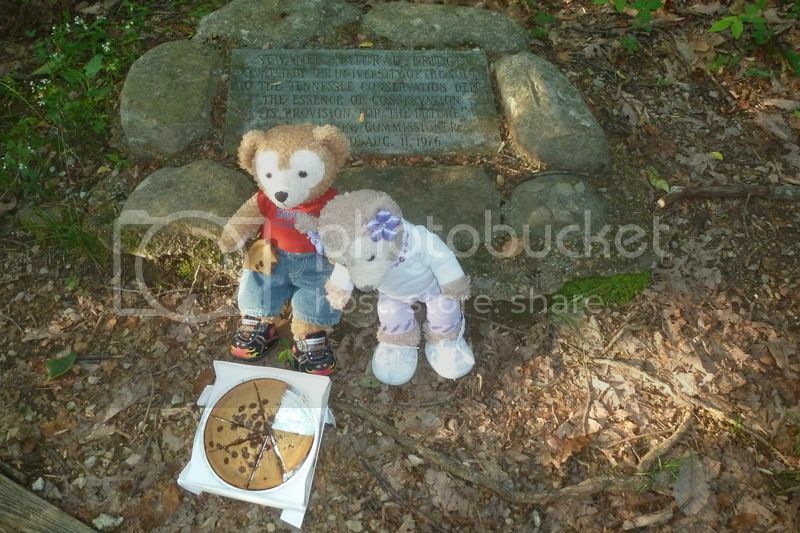 "These people must not know the 'leave no trace' rule," said Shellie May of the etched graffiti. Shellie May got over it pretty quickly as she discovered more flowers. "Shellie May! Don't get too close!" I warned her alarmingly. By this time it was so bright that Duffy put on his sunglasses. 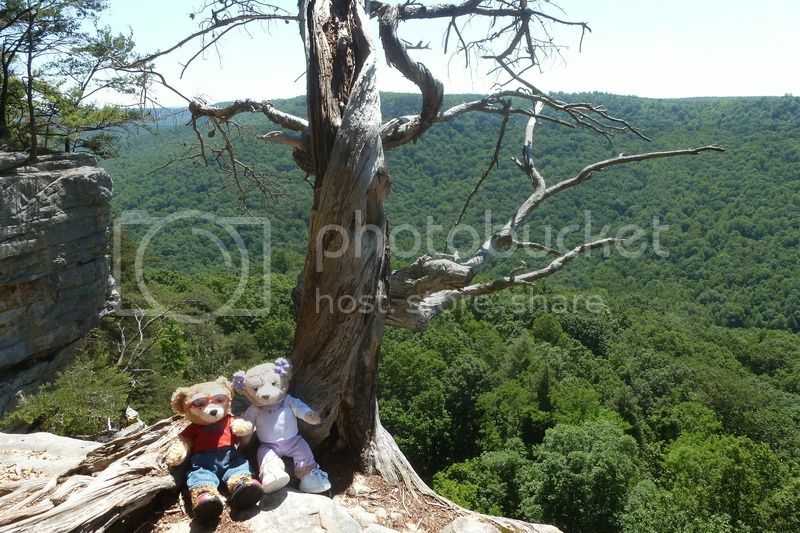 Da bears are posing in front of a dead tree at Savage Gulf. 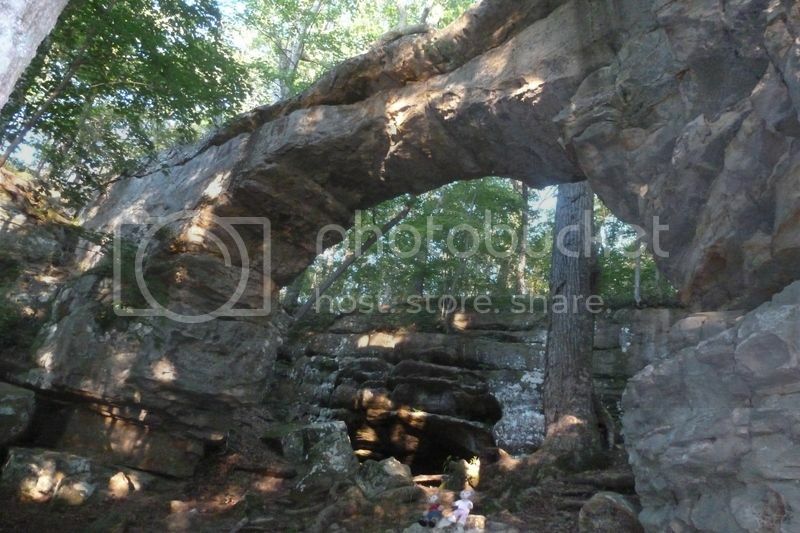 Lastly we went to Flat Rock Cedar Glade in Murfreesboro, TN. 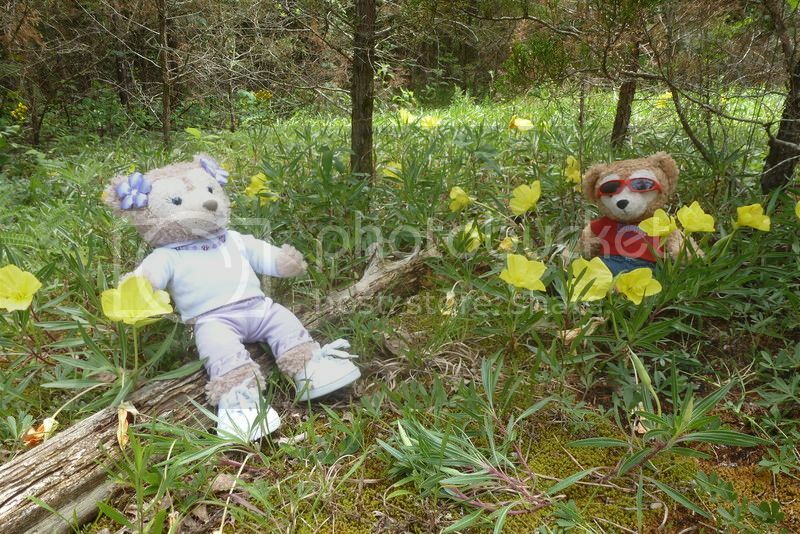 "I'm glad I wore flowers in my fur," said Shellie May as she admired the bright yellow flowers, getting pollen all over herself. He got pollen all over himself, too. 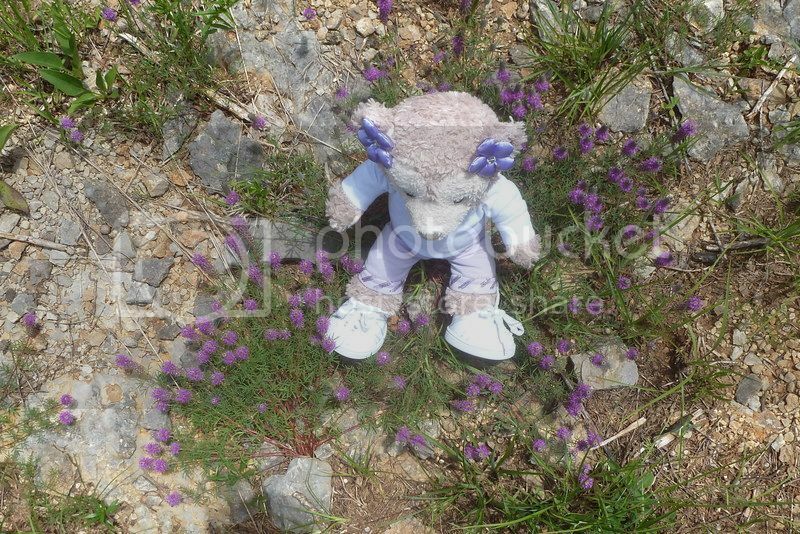 Shellie May made herself comfortable in a patch of purple flowers. The weather was perfect; it started off sort of cool but sunny, and warmed up to low 80's with low humidity. Thanks, Eeee-va! I'll upl them when I get home. I have photos but I can't upload them because they're too big! How do I resize them? Like is there an app I could use to crop it to the preferred size? 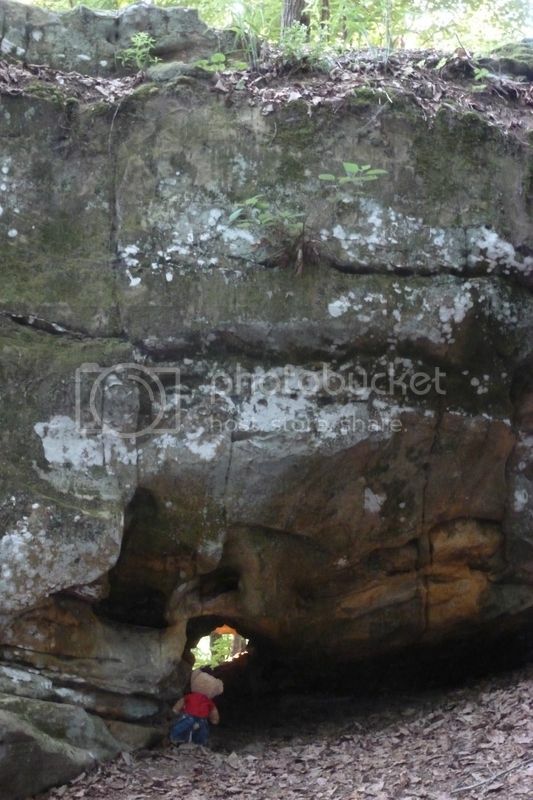 Shellie May is claustrophobic which is why she wouldn't go into a tunnel or a cave, but heights don't bother them. They love to climb! Eeee-va: Thanks for the help. 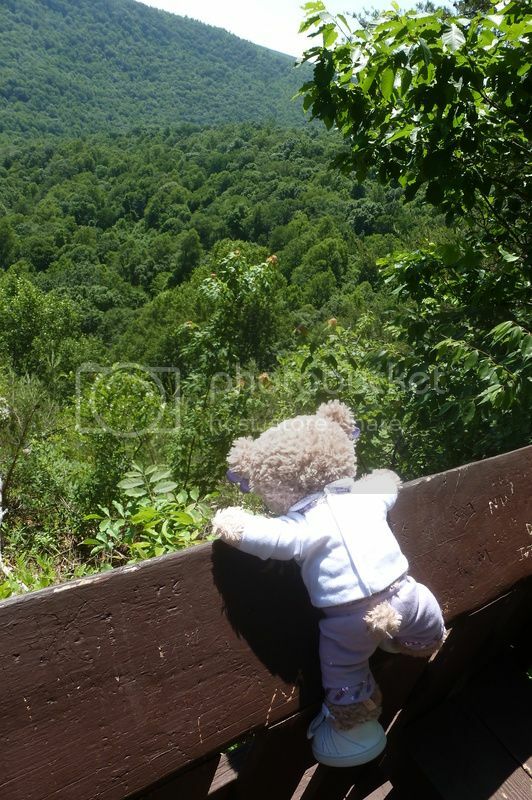 Love your bears adventures JillT. Thank you for sharing them. 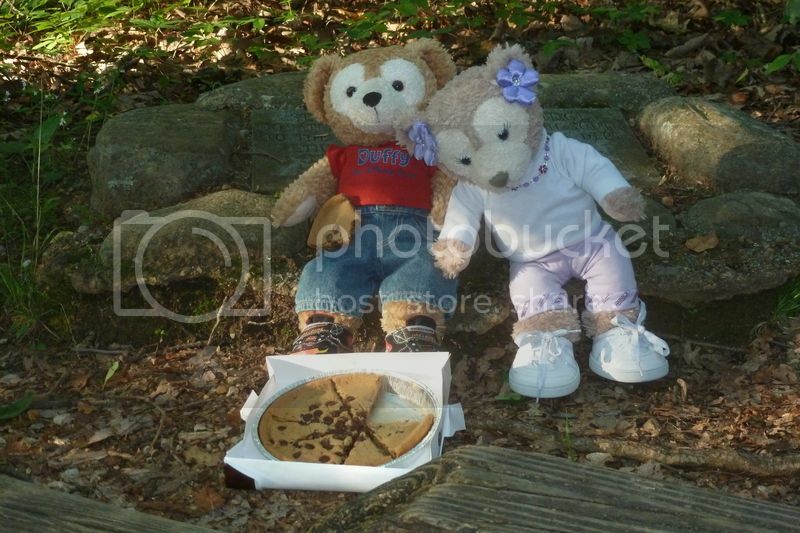 Duffy Bear Allonsy your pic is too cute! I love the "Mew Mew" part, can just picture him saying that!